In a previous post, we discussed some of the most popular crowdfunding platforms for authors. Crowdfunding books for authors is another form of the wildly popular rewards-based form of crowdfunding, the kind popularized by giant crowdfunding companies, Kickstarter and Indiegogo. Taking a look at Pubslush's top campaigns as sorted by amount raised, you can see that even the top authors aren't raising millions of dollars on the site, but rather building small communities of fans. 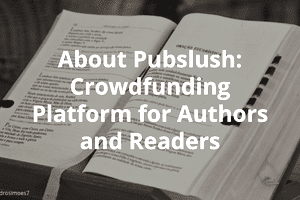 Pubslush's brand of crowdfunding lowers the financial risk of publishing a book, effectively testing the market by potentially attracting thousands of new readers who can back the project before its published.